A little while ago I read about a new reading project: A Non-Fiction Adventure. At first I thought I would be mad to take on another reading project, but when I thought a little more I decided that it was something I really should do. Because I used to read a lot of non-fiction, but over the last few years I have read next to nothing. It isn’t that I haven’t found books that I’ve wanted to read – I’ve found lots – but I haven’t picked them up. So I need a push, to make me re-balance my reading, and this is it. 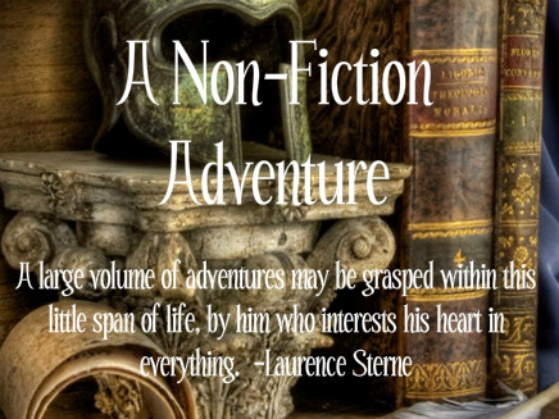 Inspired by Jillian’s Classic Club, Michelle of The True Book Addict has put together a spin-off for non-fiction novels, A Non-Fiction Adventure. Choose 50+ non-fiction books; the number is up to you. Choose 50, 75, 100, 200. It’s entirely your choice. Books must be non-fiction–biography, autobiography, history, memoir, cooking, travel, science, etc. I’m listing fifty books. I’ve kept the number low because, I hope, many of these books will lead me to other books. And because who knows what might happen over the next five years. And five years from today the date will be 10th April 2017. I love your list! I’ve only read a handful of these books (mostly from the history section) but everything looks great and I’ve added a few of these to my own TBR list (I can’t believe I’d never heard of Daughters of Britannia!). It seems bizarre that 2017 is only 5 years away but I think I’m still mentally convinced it is about 2006. Good luck, I do admire all the challenges you do. This sounds such a good one. I have heard of a few of these and as I have got my history bug back, I will be checking some of these out. I have the Wendy Moore on my shelf and it is one of my own personal challenges this year to finish it. We will see…..
Great list, I want to read all of those books in your Houses section… I struggle to read non fiction so this list seems like a pretty good idea! You’ve got some wonderful books there. Period Piece is one of my favourite books, I was given it by my grandmother aged 14 and still have that much-read copy, and Daughters of Brittania is one fo those books to read when you’re feeling gloomy. It’s not a ‘funny’ book but those indomitable women can’t help but lift your spirits. I love the sound of Bobbed Hair and Bathtub Gin, must look that one up. Another challenge, so tempting! I hadn’t even finished reading your list when I stopped reading and started making one of my own. I shall try to resist joining this challenge but I don’t know if I can. I’ve only read one of the books on your list, The World That Was Ours by Hilda Bernstein, which was both wonderful and terrifying. I think I’ll be adding a lot from your list to my nonfiction TBR list! Good luck! There are some great books in your list. I too read very little NF despite owning and desiring to read lots. I don’t think I could commit to this challenge though. Good luck with this! I’ve been trying to increase the amount of non-fiction I read but I think this challenge would be too much for me. Winter King is the only book on your list that I’ve read, but a lot of the others sound very intriguing! Had a lot of fun reading your Non-fiction TBR list… Great selection of titles. I adore NF, and managed to add some new titles to my own TBR from your selection. 🙂 I own “Love Among the Butterflies” and “Period Piece” and have been looking forward to those. “Behind Closed Doors” is fabbo, and I’ve heard good things about “If Walls Could Talk”… (You might be interested in Judith Flanders “Inside a Victorian House” which is similar but different. Also Bill Bryson has a good history of the home out as well.) And both the Juliets (Nicholson and Gardiner) are on my shelves as well. I’d love to go through your bookshelves. I think we’d have a lot of overlap. Here’s to happy reading! What a great idea! And I love your categories! Period Piece has been gathering dust on my bookshelves ever since I bought it Cambridge last year – if I ever get around to drawing up a list of my own (I am sorely tempted) it will definitely be going down on it. As will the Judith Thurman biography of Colette, which sounds fantastic. What a fantastic list! I’ve read about 2/3 of them & enjoyed them all. I suppose if I had to choose 3 favourites they would be Period Piece, Time-torn Man & Behind Closed Doors. This sounds like one challenge that will be a continuous delight. Just as well you have 5 years to finish it.